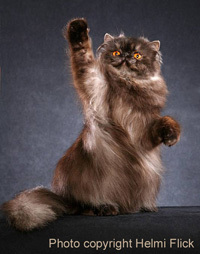 The Persian cat is one of the top cat breeds. It has been like that for well over 100 years. It is also one of the world’s first cat breeds. For a long time it was the world’s most popular. It has probably lost that position over recent years. If you wanted to write about the Persian cat in a few words you would say that this is a stocky – rounded and quite large – cat of many colors and patterns with a flat face, small ears and a long but unclear history which starts before 1900. The history of this cat is one of the most interesting topics. You can see from the globe in the picture that I have put a question mark over where it comes from. The Persian is named after a country that was called Persia and is now called Iran. There is a story that the Persian was brought to Italy from Persia in 1620 about 400 years ago. But this may not be the complete story. The Persian may have come from Turkey. What is probably true is that this cat breed comes from an area that includes Turkey and Iran. Today, it cannot be said that this cat comes from Iran because it has changed too much. The first Persian cats were very different to the modern Persian cats. You can see in the picture that the cat has changed in the way it looks. This is an important part of Persian cat facts. The first cats were fairly regular looking cats, like long haired moggies. Then around 1950 people who liked the Persian cat wanted to make the cat look more interesting and glamorous. They did this through “selective breeding” which was basically putting two cats together that they liked the look of and hoping that their kittens would be cats that they liked even more. If you do this sort of thing for years you end up with a cat that looks very different. Today there are two types of Persian cat. Some people prefer the old fashioned Persian cats. These are called “traditional Persians” or “doll faced Persians” because of their sweet faces. These cats are still popular and probably getting more popular. Other people prefer the modern flat-faced Persian. 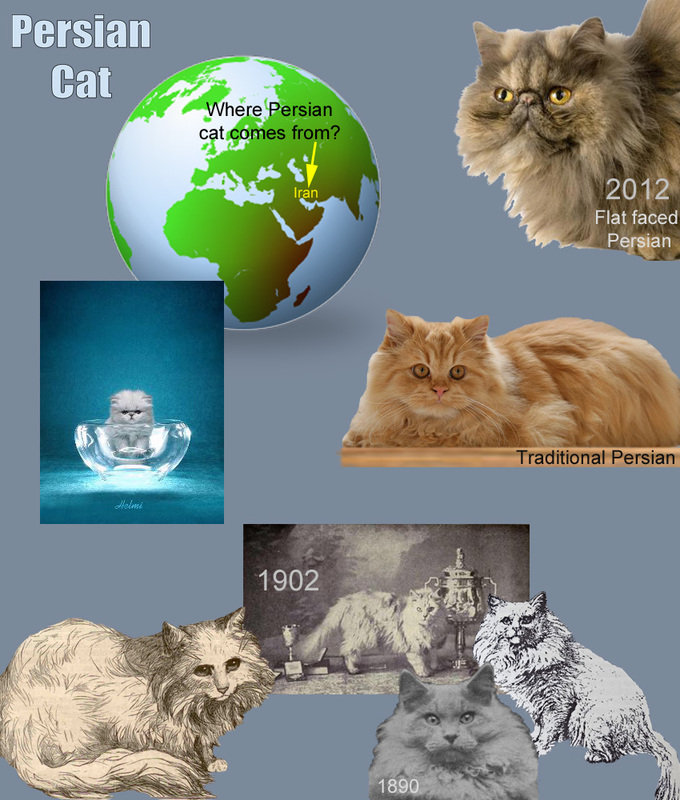 Persian Cat Facts For Kids. Photo credits: Globe Wikimedia Commons. Modern Persian 2012 copyright Stockxpert. Ginger traditional Persian copyright Dani. Persian in glass jug copyright Helmi Flick. Persians from 1890 to 1902 in the public domain. What Does the Persian Look Like? Today most Persians have flat faces. The people who know these cats very well make rules that say the cat must have a face that looks like it has been squashed but the head should be round. To make the head look more round the ears have to be small. They also like this cat to be generally round with extra long fur and a “ruff” (longer fur around the shoulders). The nose should be very short and turned-up. The eyes should be round too. You’ll see the Persian cat in a huge range of colors and patterns. The Persian is quite a large cat weighing about 8 to 15 lbs (3.5 to 7 kilograms). I have to mention the health of the modern, flat-faced Persian cat briefly. Because the face is so flat this cat can have problems with tears flowing down the face. You might notice that sometimes. Also these cats might have breathing problems and problems with their teeth not fitting together properly when the mouth is closed. About one in every three Persians has a problem with their kidneys called “polycystic kidney disease”. This is a serious health problem. If you want to read a page on Persian health for adults click this. Two things come to mind. You’ll need to make sure her coat is kept in tip top condition by helping her with grooming. Daily brushing and gentle combing is needed. Also the Persian is probably best kept inside or in an enclosure (a protected, safe place which is half inside and half outside) because her long fur might pick up dirt and because of her gentle character. One reason why Persians are so popular is because they are said to very laid back. I wonder whether this is completely true because there are stories of Persians not using their litter tray because they are nervous. Anyway they are great companions but need a nice friendly place to live in so that they feel safe and relaxed. They like to spend time lounging around and looking. They are sweet and gentle with pleasant voices. Remember though that the wild cat lurks inside the cat. If she does go outside she’ll be as good as any other cat at catching a mouse. The shorthaired version of the Persian is an Exotic Shorthair. The Himalayan is a Persian with a coat pattern that is like the Siamese cat – darker on the face, legs and tail.